In the depths of a dark coal mine, a miner’s light was essential to their work. Without light there was no sight, no work, and no wages but this essential light could also be lethal. Explosions could be caused due to miner’s lamps igniting gas. Before 1850, miners would use candles or small lamps that were hung from crevices or hammered into timbers near their work. Miners often carried open flames into the mines in the form of candles and hanging lamps, and later wore the open flames of carbide lamps and oil-wick lamps on their caps and helmets. 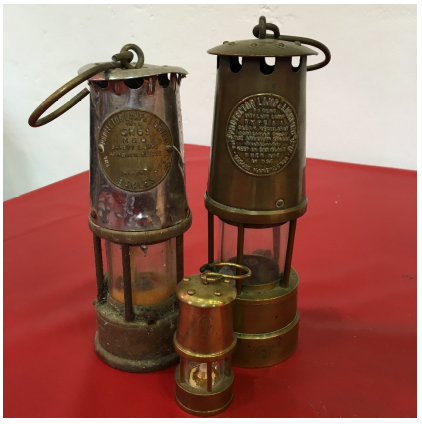 Used in conjunction with oil-wick and carbide cap lamps was the safety lamp, a much larger lamp that could not be worn, but had the advantage of a sheltered flame that would not ignite any flammable mine gasses. In the early 1820s, Sir Humphry Davy discovered that a flame enclosed in mesh would not ignite flammable gasses. The fine metal mesh served to cool the flame so that it no longer had the energy required to ignite the flammable gas in a mine. Mine safety lights eventually developed to include a glass enclosure around the flame for better lighting and metal bonnet to better protect the flame. 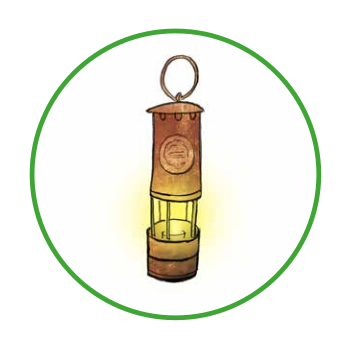 Even though it was developed in the 19th century, the safety lamp was not enthusiastically adopted by miners. Many miners objected to using safety lamps because they were cumbersome, could not be worn on the cap, and gave a poor light, all serving to reduce a miner’s efficiency. Eventually electric lighting and electric cap lamps powered by a cable which led to a battery that hung from the miner’s belt were used in mines.